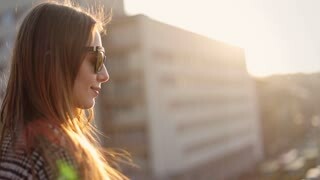 Beautiful woman in sunglasses standing on balcony and smiling on a camera. Portrait of a beautiful blonde woman smiling wide to the camera standing near a modern building in the city center. Portrait of young beautiful woman standing near the Eiffel tower in Paris, France, looking at camera and smiling. Close up portrait of Beautiful Young Woman smiling standing on the background of the sea.